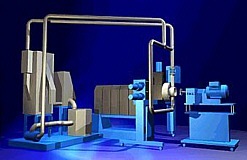 Pelletizing equipment can range greatly in cost and complexity from a simple water bath strand system and cutter to automatic water slide systems and computer controlled under water pelletizers. Materials, end product use and budget constraints can all affect the style of pelletizer selects, and the style of pelletizer often influences other equipment, such as the screen changer and the possible use of a gear pump of diverter valve. The entire process must be considered right up to the pelletizer to assure product quality and reliable operation. Getting the correct pelletizing technology for the process. Maximize line productivity and product quality. Installation of a low maintenance, trouble free system. Please respond below for a detailed quote, or give us your specific needs, and we will find the right pelletizing system for you. All systems subject to prior sale.